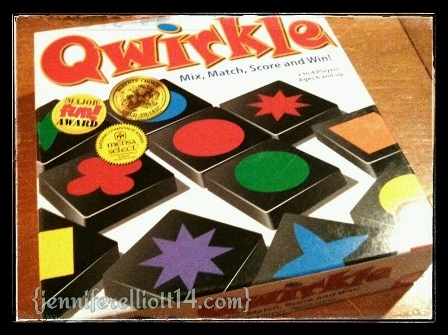 MY QUICK HOW-TO PLAY QWIRKLE: IF YOU KNOW HOW TO PLAY SCRABBLE THEN YOU KNOW HOW TO PLAY QWIRKLE. 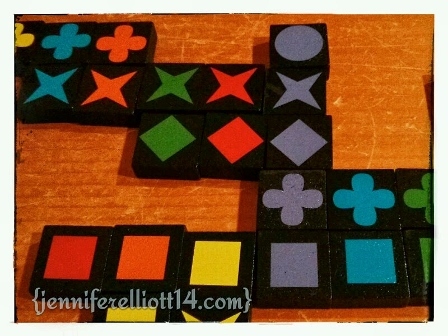 INSTEAD OF TILES WITH LETTERS, YOU PLAY WITH TILES WITH COLORS AND SHAPES. YOU CREATE ROWS OR COLUMNS, MATCHING SHAPES OR COLORS. 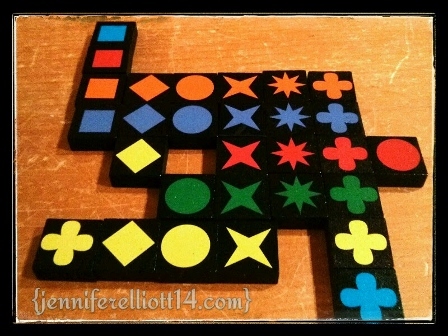 WHEN YOU MATCHED ALL SIX TILES WITH SHAPES (LOOK AT THE COLUMN OF CLUBS AT THE RIGHT) OR COLOR (LOOK AT THE YELLOW ROW), YOU HAVE A QWIRKLE! EACH PLAYER WORKS WITH SIX TILES AND PICKS NEW TILES AFTER PLACING OTHER TILES. ABOUT THE PICTURE: THREE OF THE SIX TILES IN MY HAND. 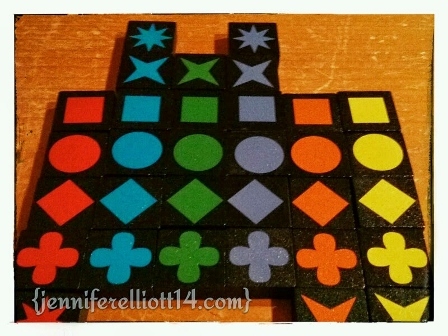 WHEN I COMPLETE A QWIRKLE, I LOVE SINGING OUT THE WORD. 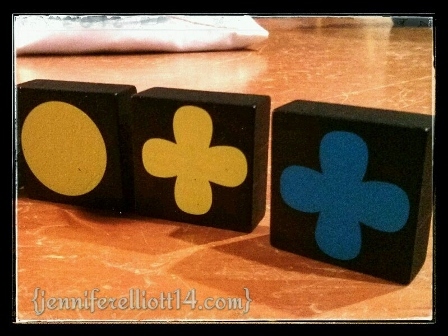 ABOUT THE PICTURE: THE START OF A SUPER TIGHT GAME WITH ME, CHARLIE, AND KRISSY. IN THE END, CHARLIE WON THE GAME BUT KRISSY WAS A CLOSE SECOND. I WAS A VERY DISTANT THIRD. I love that game! Took me awhile to get used to it but I love that game!